Do you consider yourself a lifelong learner? I do. I hope you do. As I write this, we just had the 6th of 8 sessions of Leadership 2.0 with Steve Gasser and Giant WorldWide. How does my mind implode each and every class? ‘How do I not know these things,’ or ‘how do I not recognize these things,’ or ‘HOLY COW, I CAN’T WAIT UNTIL NEXT MONTH,’ are all thoughts going through my gray matter when I walk out the door. This spring we have a couple personal and professional development programs which you can plug in and LEARN more about YOU and YOUR TEAM. I hope you make the time for yourself and your team to attend one or both I am sharing with you today. Video stream, with personal contact and follow-up between sessions to help you take what you’ve heard and make it into an action plan. When we publish this article, we will have just hosted the first Business Connection at Ashley HomeStore. As I write this almost 60 people have rsvp’d! Humans need human connection. I looked up human connection facts and found hundreds of studies done to prove it. However, with the onset of the digital age, more people are becoming disconnected from human contact, which used to be suffered by the elderly, or outcasts. We’ve seen the digital world change how we interact, but have you also seen what I have observed? People circling back to communicating face to face, picking up the phone to hear a voice, social gathering where phones are put away…. We are realizing what we crave and need is each other. Business Connection, First Friday of the month, 7-8am. You can also host a business connection, or partner with another business to host. Business After Hours, the second Thursday of each month, Jan- May, Oct-Dec, 4-6pm. This has been scheduled out almost an entire year in advance. We can hook you up. For the Under 40 crowd- PULSE social events scheduled quarterly, and Lunch and Learns are held the second Wednesday 12-1pm Squeakys. Check out their Facebook page. PULSE is Professionals, Under 40, Leading, Socializing, Educating. Hutchinson Leadership Institute and Leadership 2.0 are not only great personal and professional development classes, but great ways to connect on a deeper level, building a network of trusted friends. Committees: Agri-Business, thinkLOCAL, Golf, Made in McLeod, PULSE, are opportunities to meet with a common goal or industry. If you would like more information on any of the above…. Please call us at 587-5252! Make a connection today, this week, this month. What if there was no chamber in Hutchinson? Let’s think about Hutchinson without the Chamber and Tourism office. No visitors’ guide would be published, and no guides would be mailed out to prospective visitors, nor to visitor centers around the state. Over 1000 guides are mailed each year from requests, and 49 statewide centers display our visitor guides. Leadership Institute would be gone. Almost 800 people have gone through the program in 30 years. YOU matter to us. Our work is about YOU. Thank YOU for being part of the Hutchinson Area Chamber of Commerce & Tourism organization. Most of use have benefits through our employers. We try to utilize those employee benefits to make our life better, healthier, balanced and maybe just a little easier. It’s what we do; use those benefits for maximum advantage for ourselves. Your Chamber Membership comes with benefits also. Benefits to make your business better, healthier, balanced and maybe just a little easier. See what I did there? Whether you look at your chamber membership as a buffet, or business muscle builders: we are here to help your business. Maybe you’re seeing emails from Ashley about your membership benefits, but discard them because you are too busy to look at them right now. Maybe you see messages about events or programs, and think you’ll go back to those later. Maybe it’s time you take the time to look at what you are utilizing and what’s being left on the table but could help you market/build/enhance your business. Form your online portal to your web page on our website which gets many searches daily, to networking programs to get out and “press the flesh,” to educational opportunities to build skills, networks and confidence… the chamber has a lot to offer. We’re your connection to the source, the answer, the obscure, the odd, and many times, just the right person to help you do what needs to be done. So as you review your business benefits, let’s review your chamber membership benefits and find the best options to help you be bigger, stronger, faster! Happy New Year from our staff and Board of Directors! I can’t keep calm. SMALL BUSINESS SATURDAY is coming! It’s November, the leaves are changing, the air is crisp and we are warming up the red scarves to give away… MONEY! Yes, the Chamber is giving away money again. Want in on the fun as a business? Provide the chamber with gift cards, gift certificates, tokens, or items to give away during the ball drop. It’s a great way to drive traffic into your business. Follow this link to get the download for the ping pong ball drop information. The balls will be dropped from a large truck and bucket along Washington Avenue. We’ll have separate ball drops for adults AND kids. Chamber Board Members will be out paying for people’s bills as well… Why? Because the incentive to bring business to you is VERY important to the board and staff. The chamber has Small Business Saturday materials for you if you haven’t signed up through ShopSmall. Give us a jingle and we’ll help you make the most of your Small Business Saturday! I’m constantly amazed at what people will or will not complain about. Some are content with whatever is put in front of them, others… well they complain about not having something to complain about. Arts & Crafts is a fundraiser for the Chamber, AND, a tourism event. We use money from both sides of our budget for the festival. Businesses in town are busier, gas stations are hopping, and hotels are filled. Businesses downtown lose parking, many close during load-in and the festival itself, some may lose money, some may make more. But it is decidedly BUSIER and traffic is congested. LOTS to complain about… right? No! Our businesses are so understanding of the importance of this event to our entire community. Many tell us they look forward to the people watching, or they utilize the opportunity to do some training, or give their hard working employees a day off, or even have the celebrated day in a closed office- you know what I mean- no one comes in or calls, and you can actually get work done. We have VERY LITTLE grumbling, complaining, or rudeness from businesses. The bigger picture in Hutchinson is the sense of community: the opportunity to show off our community with pride. So this isn’t about complaining, this is about a bright and happy community willing to push and pull when needed, ebb and flow, and ying and yang for the betterment of Hutchinson. What’s Happening in August 2018! 2018 Hometown Golf Challenge – Thank you! We would like to thank everyone that joined us for the 2018 Hometown Golf Challenge “Around the World in 18 Holes” on July 23 at the Crow River Golf Club. The event would not be possible without our mighty volunteers and the businesses that donated to and sponsored this event. THANK YOU all for your time, talents, donations and support!! MILLE GRAZIEO to our Visionary Sponsor – Citizens Bank & Trust Co and also to our Champion Sponsors – 3M, Hutchinson Health, MidCountry Bank, MITGI, TDK/Hutchinson Technology and Uponor. DANKE, DANKE also goes out to our Welcome Sponsors – MITGI, SouthPoint Financial Credit Union and TDK/Hutchinson Technology. JE VOUS REMERCIE to our Staffed Hole Sponsors – APR, Ashley Homestore, Citizens Bank & Trust Co, Buffalo Wild WIngs, Hutchinson Health, Marco, Oakdale Golf Club, TDK/Hutchinson Technology, Uponor, Wells Fargo Home Mortgage and Woodstone Senior Living. TACK, TACK, TACK are in order for our Hole Sponsors – 3M, Branded Solutions, Cash Wise Foods, Caspers Chiropractic, CenBank, Century 9 Theatre, Crow River Winery, Edina Realty, Fairway Mortgage Company, First Minnesota Bank, Goebel Fixture Company, Hutchinson Dental, Hutchinson Leader, Hutchinson Manufacturiing, LBC of Hutchinson, Novation Credit Union, Nuvera, Piehl Hanson Beckman, Plumbing and Heating by Craig, Rahk Studios, SouthPoint Financial Credit Union, Stamp N Storage, State Farm – Steve Kropp, State Farm – Mike McGraw, Valley Sales of Hutchinson and Walmart SuperCenter. And last but certainly not least, GRACIAS to our Hole-In-One Sponsors: Citizens Bank & Trust Co and Valley Sales of Hutchinson. Buh Bye until next year! 2018 Crazy Days & Manufacturing in the Park – Thank you! Thank you to businesses that participated in Crazy Days and Manufacturing in the Park! What a great way to see how our manufacturers, educators and related organizations work, who they are and who they are looking for! Also, a special thanks to those who attended. These events would not be a success without you! Check out our Facebook page to view event photos. Hutchinson Leadership Institute & Leadership 2.0 Enrollment for 2018-2018 is Now Open! We are happy to announce the Hutchinson Leadership Institute is back for its 30th year! The Hutchinson Leadership Institute is hosted by the Hutchinson Chamber. This comprehensive program is designed to build community leaders. Over the period of nine months, participants will experience 10 days of training and classes. Each participant will be assigned to a group service project, which will assess community needs, determine a project, and facilitate the project working with other community members and/or groups. Once you have completed the Leadership program, you can participate in Leadership 2.0! This brand new program will take a deeper dive into personal leadership and how it can impact the future of your business and the entire community. 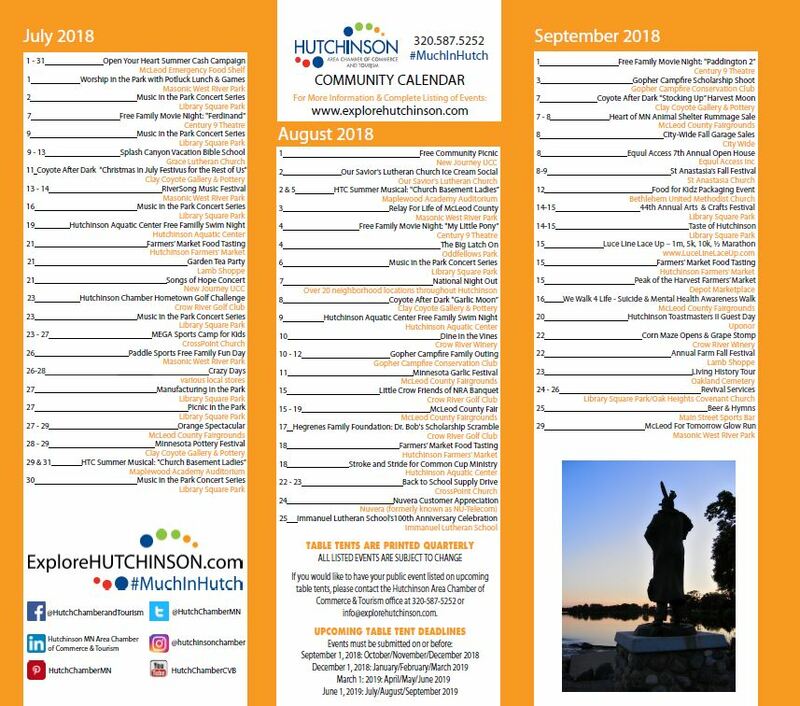 Click link for the Hutchinson Leadership Institute application (pdf) or Click here for the Hutchinson Leadership 2.0 application (pdf). If you have questions about the Hutchinson Leadership program, please click here to email Mary at the Chamber office or click here to call Mary at the Chamber office at 320-234-0785. Each harvest season, our Agri Business committee works hard to deliver buckets of goodies to our farmers in the fields in McLeod County. If your business is interested in supplying goodies or money for this program, please complete and return the 2018 Farm Fatigue Flyer (pdf). Make sure to put September 14th & 15th on your calendar! In August we will be highlighting Nuvera as our Business of the Month. Click here to learn more about Nuvera. Thank you to our August renewing members! Click here to check out the Ambassador’s Facebook to see photos of all the visits and other special events hosted by the Ambassadors. Business After Hours is not held in August or September. Business After Hours resumes on October 11th with Tigers After Hours. The TigerPath teachers will be on hand to explain how they will helps students discover their talents, develop their skills and build an exciting, rewarding career! “Find your own path” – that’s what it’s all about! Business After Hours is a great way to learn about businesses in Hutchinson and network with fellow chamber members. This monthly event is Chamber invitation only and a way to get behind-the-scenes at our local businesses. Businesses interested in hosting a Business After Hours event, should contact the Ambassadors. Click here to email the Ambassadors. It’s a challenge to hire good people with the skill sets you need and want. It’s a challenge because we have fewer people in the pipeline than we have leaving the workforce. It’s going to continue to be a challenge, for a long time. Click here to read the rest of Mary’s article. The Chamber prints and delivers 900 table tents around the community. Are you looking for a way to boost an upcoming Hutchinson event? Make sure you get your event added to the Table Tents! The cost is $20/listing for Chamber members and $30/listing for non-members. Also, if you submit an event to our table tents, make sure to add it to the online community calendar. The community calendar averages about 100 views a day, so don’t forget to utilize it! Submitting an event to the community calendar may be done through your chamber member portal or the chamber website. Click here to access the Chamber’s Community Calendar! The deadline for Quarter 4 (October, November & December) is September 1. Click here to email Gina with questions, if you want table tents delivered to your business or if you want to submit an event for upcoming table tents. Instead of ranting or raving about what you can do…. I am sending you directly over to our Pinterest Board Building Your Business. Here you will find a VARIETY of info graphics about retention, employee engagement and recognition. RETENTION is the new black. Wear it well.